Carolina Herrera Bridal's sleek 'Harlow' gown is crafted from smooth silk that's draped into an a-line skirt with hidden side pockets. The dress features a ruched off-the-shoulder neckline with a twisted knot at the chest. Top your bridal look off with a sparkling diamond necklace. Strapless dresses continue to be a popular trend throughout the year. 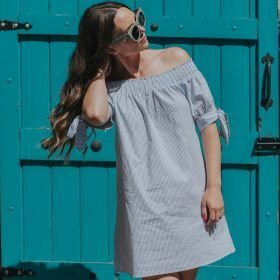 Obviously wearing an off-shoulder dress in the sunshine is all our summer dreams however there is nothing stopping us wearing a strapless bodycon dress with a pair of tights and heeled boots come the festive season. At Fashiola we love strapless dresses because they are so great to wear with statement jewelry and more specifically a funky pair of hoop or tassel earrings. Strapless dresses work for all bodies so whether it’s a sweetheart neckline or a plunge bandeau just make sure you have a great strapless bra to go with it!